My publisher has placed the ebook edition of my novel Dragon’s Fall: Rise of the Scarlet Order on sale for just 99 cents through March 17. It’s billed as book 2 of the series because I wrote it second, but it’s actually the first of the two adventures I wrote about the Scarlet Order vampires and tells their origin story. This is the tale of three vampyrs. Three lives. Three intertwining stories. Bearing the guilt of destroying the holiest of books after becoming a vampyr, the Dragon, Lord Desmond searches the world for lost knowledge, but instead, discovers truth in love. Born a slave in Ancient Greece, Alexandra craves freedom above all else, until a vampyr sets her free, and then, she must pay the highest price of all … her human soul. Three vampyrs, traveling the world by moonlight—one woman and two men who forge a bond made in love and blood. Together they form a band of mercenaries called the Scarlet Order, and recruit others who are like them. Their mission is to protect kings and emperors against marauders, invaders, and rogue vampyrs. The question is, can they survive their battle with their ultimate nemesis, the human known as Vlad the Impaler? Like my novel The Pirates of Sufiro, Dragon’s Fall: Rise of the Scarlet Order is a novel comprised of novellas that all tell one over-arching story. The first novella is set in Ancient Greece and tells the story of Alexandria. The second is set in Britain and tells Draco’s story. The third tells how Draco and Alexandra meet. The result is a tale that spans the ages of these immortal creatures. 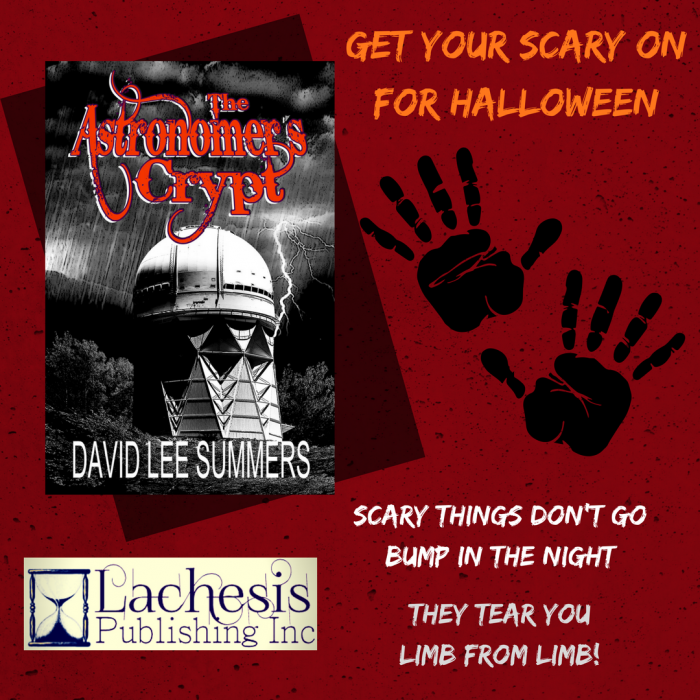 This week, my novel The Astronomer’s Crypt is Lachesis Publishing’s Book of the Week. In my novel, astronomers, ghosts, drug dealers, and a monster from the beginning of time collide at a remote observatory during a violent thunderstorm. You might ask why a professional astronomer who operates telescopes would set a horror novel at an observatory. There are actually several reasons I chose to present this as a venue for a scary tale. First, one of the scariest movies from my teen years was Ridley Scott’s movie Alien. Part of the reason the movie was so effective was that I was a big Star Trek and Star Wars fan growing up. Alien allowed haunted house horror to encroach on the “safe place” of science fictional optimism and action. Sure, Star Trek and Star Wars had their scary moments, but those moments were soon relieved by the heroes escaping the scary situation, a logical scientific explanation, or even humor. In Alien, the scary moments never let up. What’s more, the space ship was dark, dank, and full of shadows, not like the bright and colorful ships of those other science fictional franchises. For me, having a monster on the loose in an astronomical observatory is very much a call back to Alien. Setting a horror story at an observatory is also something of an homage to one of the masters of twentieth century horror, H.P. Lovecraft. He was fascinated by astronomy and actually wrote scientific articles. Of course, he imagined ancient creatures from the depths of space to be among his horrors that tormented those people who dared to look in dark places. 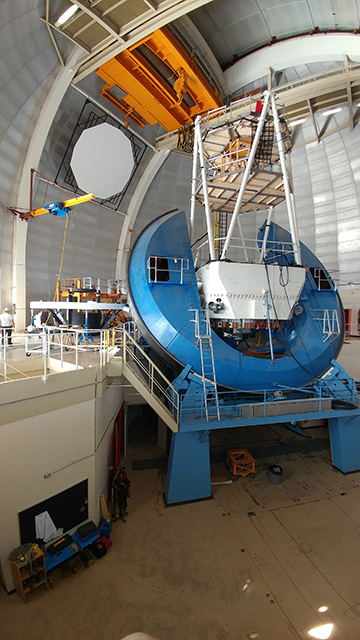 Arguably one of the most important reasons for setting a horror story at an observatory relates to the adage, “write what you know.” I’ve worked at observatories for twenty-two of the last thirty years. Ironically, I feel comfortable and even safe working at observatories. However, some of the scariest stories happen in places where we don’t expect horrific things to occur. It’s one of the reasons Ray Bradbury could scare people with a story set at a fun carnival, and why Stephen King could scare us so effectively with a resort hotel in the Rockies. If you watch science shows, you’ve undoubtedly seen an astronomer speaking about the mysteries of the universe. You don’t expect something horrible in that situation. And yet, it’s never far from the back of my mind that horrific things can happen. We’re at a remote site with wild animals. 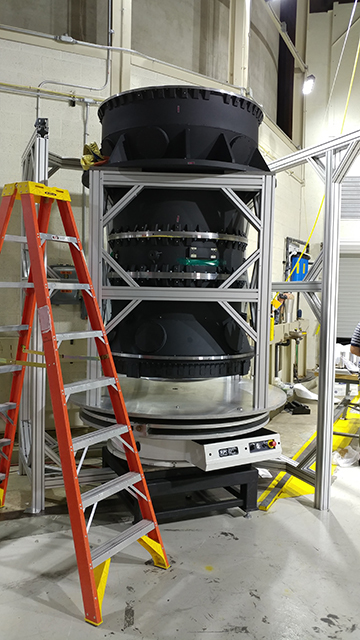 Observatories have big industrial equipment that come with their own safety issues. We work in the dark, in big, windowless buildings. When the power goes out, it can be really and truly dark. I’ve made the mistake of going into rooms without a flashlight and having doors close behind me and becoming quickly disoriented. There are access hatches that open into big, open areas. Those of us who work at observatories have to be ever vigilant to make sure accidents don’t happen. I’ve also spoken at some length about how some observatories have literal crypts in or near their structures. James Lick is buried in the pier of the 36-inch telescope and Percival Lowell is interred in a mausoleum just outside the 24-inch telescope where he observed the features he thought were Martian canals. In The Astronomer’s Crypt, I dared to take a place I loved and then scared myself by imagining the worst possible things happening. This Halloween, I dare you to come along with me and peer into the dark places behind the scenes at an observatory. Last year, I had the pleasure of traveling to Baltimore for Balticon 50 where eSpec Books released it’s collection of steampunk fairy tales called Gaslight and Grimm. I’m honored to be one of the contributors and it was a real delight to meet many of my fellow contributors. One contributor I was pleased to meet was Christine Norris. The reason is that we had worked with each other at LBF Books almost a decade before, but this was the first time we’d actually had a chance to meet face to face. In 2005, I edited Christine’s young adult novel Talisman of Zandria, then edited its sequel, Return to Zandria in 2007. I thought these were terrific stories and I enjoyed getting to know the protagonist, Ivy Peterson. Here’s a little bit about each of the novels. When Ivy Peterson sees the most extraordinary thing in her own backyard—a fairy—she dismisses it as a daydream, but she quickly realizes that it was, in fact, the real thing. She goes in search of the mythical creature, and accidentally falls into Zandria, a magical world that exists just outside her own. Unfortunately, she finds that she’s trapped there. Someone has stolen the Talisman, a magical amulet that controls the five gates between Zandria and her own world. Ivy and her new friends, the wizard Arden, his young apprentice Connor, and a pair of fairies set off on a quest to reclaim the Talisman of Zandria. Ivy Peterson was not ordinary. Ivy was More-Than-Ordinary because once she found herself in a very special place and had a very special adventure. But Ivy was far too old for fairy tales…wasn’t she? It has been three years since Ivy recovered the Talisman of Zandria, and her life is very different. She is no longer the shy young girl who chased a fairy through a magic gate, but a teenager, concerned with clothes, friends, and school. She has nearly forgotten about the special world that exists on the other side of a thin, magical veil. But they have not forgotten her. Now a crisis is brewing in Zandria, and only Ivy can help. They implore her to come to their aid, and Ivy’s memories of adventure pull her once again into the enchanted world of mermaids, dragons and wizards. Reunited with old friends, and bringing a new one along for the ride, Ivy must now lead them into the wilds of her own world, and not only keep them safe, but stop an empire from falling into the clutches of evil.